Vietnam’s start-up Bamboo Airways has secured a licence from the local authorities, the company said, opening the way for its maiden flight in January after a string of delays. US-based Pfizer Group, one of the world’s premier biopharmaceutical companies, has signed an agreement on the transfer of pharmaceutical production technology to Vietnamese enterprises, so first products are scheduled to be produced in 2020. Food safety inspection forces will be deployed in nine cities and provinces from July 1, deputy minister of health Trường Qu’c Cường announced at a Wednesday conference on food safety, the Thanh niên (Young people) newspaper reports. Warned of the stiff competition, more investors nevertheless joined the e-hailing market after the departure of Uber last year. Inter-bank electronic payment turnover accelerated to VNĐ73 quadrillion (US$3.2 trillion) in 2018, equal to 13 times the country’s GDP, according to Phạm Tiến Dũng, director of the State Bank of Việt Nam (SBV)’s Payment Department. Vietnam has delivered to both South and North Korea its wish to host the envisioned summit between US President Donald Trump and North Korean leader Kim Jongun. The Missosology page has just released a beauty ranking of countries in 2018, based on the achievements gained in five contests – Miss Universe, Miss World, Miss Earth, Miss International and Miss Supranational. Domestic airlines plan to increase the frequency of flights by 8-10 percent during the upcoming Tet (Lunar New Year) holiday from January 20 to February 19 compared to the same period last year, according to a representative from the Ho Chi Minh City-based Tan Son Nhat International Airport. A pre-feasibility study is set to be done for the VND20 trillion ($861.82 million) Hoa Binh – Moc Chau expressway. Optimism for Vietnam’s stock market was running high at the start of 2018, before a rout erased all early gains. This year again, investors are confident. Foreign Ministry Spokesperson Lê Thị Thu Hằng underlined Việt Nam’s stance on the US vessel USS McCampbell’s passage through waters off Việt Nam’s Hoàng Sa (Paracel) archipelago, while responding to reporters’ questions regarding the case on Wednesday. Criminal proceedings have been launched against more former officials of the Joint Stock Commercial Bank for Investment and Development of Vietnam (BIDV) with the charge of “violating regulations on banking activities, other activities relating to banking activities”, the Ministry of Public Security said on January 10. The US’s Small Enterprise Assistance Fund through its subsidiary, the SEAF Women’s Opportunity Fund, has invested in and lent to Organica Investment Joint Stock Company, one of Việt Nam’s leading retailers and distributors of organic and natural foods and beverages. On Wednesday, four State-owned banks said they would cut interest rates on dong loans in the Government’s priority sectors to support firms in 2019, starting from Thursday. The Ministry of Transport plans to develop Trần Đề seaport in Sóc Trăng Province into a national deep-water seaport with large scale by using private investment. VNDirect Securities Corporation (VNDS) on Saturday held an opening ceremony for its trading house in Bình Dương Province’s Thủ Dầu Một City, two months after it gained a business licence. Hà Nội has devised a plan to cut logistics costs and improve transport connectivity in the capital city to support investors and businesses. The Director Certification Programme (DCP) was launched in Ho Chi Minh City on January 10, a key part of the Global Entrepreneur Programme designed by the Vietnam Institute of Directors (VIOD) in order to promote the best practices in corporate governance among domestic firms. VinaCapital Asset Management JSC has signed an MoU with Korea’s Kiwoom Asset Management to offer selected products to Korean investors. PV Power has set targets for total revenue of VNĐ32.77 trillion (US$1.4 billion) and pre-tax profit of more than VNĐ2.5 trillion ($107.3 million) for 2019. Its profit after tax is projected to reach VNĐ2.28 trillion, but this year’s targets are lower than the company’s achievements in 2018. 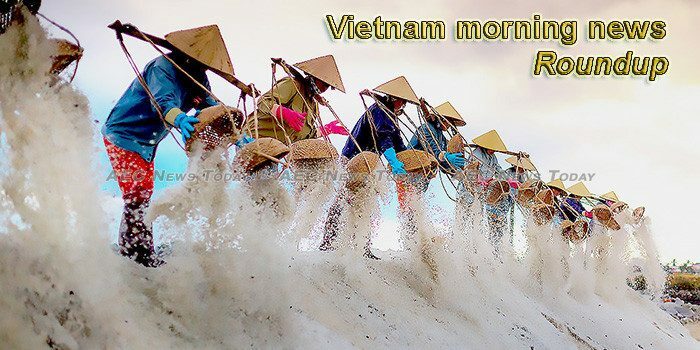 The average bonus for the upcoming Tet (Lunar New Year) in Ho Chi Minh City has been reported at more than 10.3 million VND (444.47 USD), a 25 percent rise compared to last year, according to the municipal Department of Labour, Invalids, and Social Affairs. As of January 8, 61 of the 152 Vietnamese tourists who went missing in Taiwan in late 2018 had been found, with 39 of them men and the remainder women. During the search, Taiwanese police also found many other illegal Vietnamese laborers, Thanh Nien Online newspaper reported. The Government needs to support enterprises that invest in science and technology to create national products, especially in market access, advertising and protecting their trademarks, said Deputy Prime Minister Vu Duc Dam. Vietnam Nutrition Food JSC (NutiFood) and Japanese beverage group Asahi, the owner of baby food brand Wakodo, on January 10 announced the establishment of their joint venture, aiming to bring nutritional products for children that fit Japanese standards into Vietnamese market. He wants the military’s bosses to root out corrupt practices in managing and using its assets. Tap water is coming to 19 households in Quảng Ngãi City, after four long decades. The central province of Quảng Ngãi officially presented investment registration certificates to four foreign companies at the Việt Nam-Singapore Industrial Park (VSIP)-Quảng Ngãi, with total investment of US$321 million, yesterday. Hà Nội Observatory will be open to the public from the second quarter of this year, Việt Nam National Space Centre (VNSC) announced on Wednesday, according to Thanh niên (Young people) newspaper. Farmers growing flowers and ornamental trees for Lunar New Year (Tet) holiday in many provinces are waiting for a bumper crop this year. The Nghi Sơn Economic Zone in the central province of Thanh Hóa will be expanded to 106,000 ha, ten times larger than its initial planned size, in order to meet business demand and turn the area into a driving force for the socio-economic development of the province and the north-central region.